Battlefrog is for real. 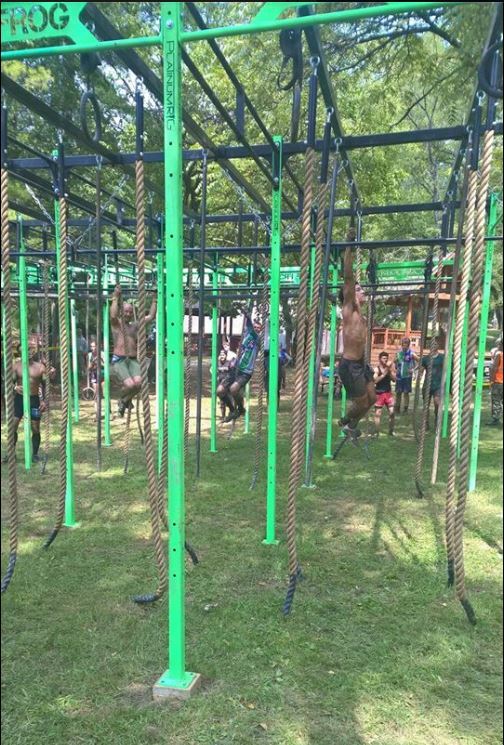 You can question the business model and long term prospects, but the challenging nature of this obstacle race is undeniable. This was my first Battlefrog, which took place on the Mud Guts & Glory course outside of Cincinnati, Ohio. For various reasons, it was also my first time running an open wave since 2011. Unlike my race reviews in the past that saw things from a competitive viewpoint, this one was shaped dramatically by the open wave participants I encountered throughout the course. Race day logistics – parking, registration, festival area, etc. Platinum rig, of course. The last set of short hanging pipes near the end appeared to be the breaking point for most. Double jerrycan carry down and up a very muddy, narrow, technical ravine. Note: I heard that it was switched to just 1 can later in the morning. Tip of the Spear. The 4 consecutive walls of board grips was the kicker. Long Wreck bag carry. Personally, I didn’t think this was very bad, but so many kept harkening to it after the race that I felt compelled to include it. It was a very professional event. Nothing at all shabby about the production and the course was probably the most challenging I’ve done at that distance. While racing in the open was somewhat refreshing, it is also showed me how different the experience can be. I now know that listening only to elite and entrenched competitive racers does not always provide the entire story. The term echo-chamber comes to mind. My elite racing friends’ experiences sounded far different (i.e. more positive) than what I heard from a half-dozen or so of others. It’s important for me to note that the rest of this review is based solely on my experience in an open wave among the non- or lesser-competitive crowd. This open wave perspective is also not necessarily Battlefrog-specific. This race just provides the context for it. It took almost no time for me to understand why elite wave heats are becoming overcrowded with lesser-skilled competitors – bottlenecks & non-uniform racing conditions in the open waves. If you are racing for a personal best, open wave racing can be frustrating. Placing the Battlefrog Extreme racers at the front of a large wave of open racers resulted in an early bottleneck on the single-track trails. It was a different (i.e. slower) pacing strategy for the extreme group who had multiple laps in mind, which meant everyone behind them was essentially stuck. Only a few minutes into the race and I found myself standing in line for more than a minute just to get on the first pipe traverse obstacle (that should only take about 15 seconds to complete). The jerrycan carry consisted of several total minutes of standing & waiting for the line to move ahead. Move 3 steps, wait 10 seconds. Move 4 steps, wait 15 seconds. I realized that any attempt to get my fastest time possible in this race was futile, dampening what was overall a pretty good experience. I’m pretty sure that bottlenecks happen in open waves of most of the more challenging courses, so this is not necessarily a Battlefrog problem. While the course was extremely challenging, I didn’t think it was ridiculously difficult or out of line with what could be expected. There were probably more than a few people in “over their heads” and I had to do a little OCR public relations throughout the day. 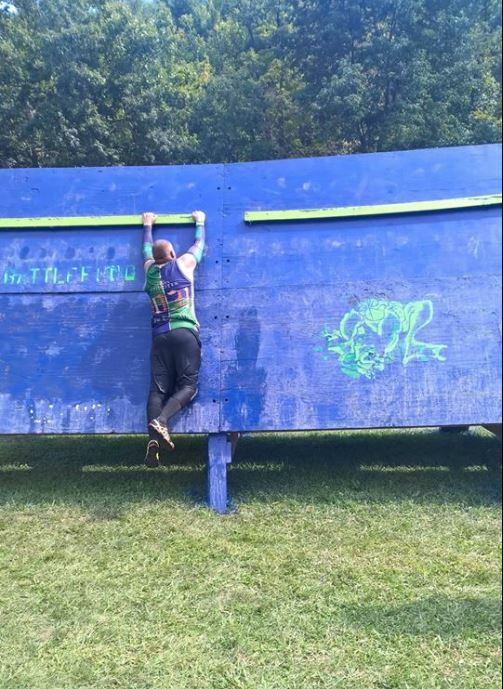 I overheard 3 separate individuals vowed they would never do an obstacle race again because of how brutal this race was and a handful of others say they would never do another Battlefrog. Granted it was only a few people among hundreds and there were many more positive responses, but I am not accustomed to that type of defeatist attitude from the more competitive racers I am around the most. It indicates to me that an invisible line may exist for the difficulty level that non-dedicated racers will accept. Finding that line is the hard part because those who never come back will likely not voice their opinion publicly. I re-read this post and see that it could be misconstrued as a negative review. To the contrary, it is not meant to be critical at all and while my racing experience in the open wave was different than usual because of a few bottlenecks, I still personally enjoyed the event overall. Most importantly, it absolutely passed the “would I do it again” test. I know Battlefrog has some really good people working for them and I hope they stay around a long, long time. For more obstacle racing reviews, news, and commentary, follow OnMyWayToSparta on Facebook. Great review of the race, as an open wave runner these things happen a lot. I also think that a lot of folks underestimated the difficulty of Battlefrog. When they tell you it’s a challenge, believe them. I think some races are easy and have given folks the idea that anyone can do them, some of these are really challenging. Please be realistic about your fitness level before you do these events. You will be much happier! Having done several BattleFrogs this year, I heartily agree with your assessment of their races. I have also seen some of the improvements they’ve been making as they work through their learning curve. What I found interesting is your view from the open wave. I’ve never run an elite wave but I do speak to some of the elite racers and listen to their feedback on races. And there is a huge gap between what the two groups are looking for in an OCR event. I think there’s a real niche here for BattleFrog and something Spartan Race would do well to pay more attention to. You can’t build courses to please the elites and also be something a beginner can tackle. As I catch up on my own writing, the Wintergreen race is a great example of a venue that could really turn off first-time racers due to the apparent desire of Spartan to take a tough course and brutalize it (if that’s a word!). Look forward to more posts!